Ghana is called the land of rhythm not least because it is the land of drums. Many of the drums are carved from Tweneboa wood which translates as "drum wood" or "drum tree." The tweneboa tree has a wide umbrella shaped crown. It is frequently planted in villages for its shade and shelter. Stained with a reddish honey-colored finish, the village and people of this nativity set exude a special visual rhythm. It is the rhythm of life gradually turning darkness into light, of night emerging into a distant sun, of the glow from within illuminating the day. In the land of rhythm even color comes alive to greet the event of Christmas. 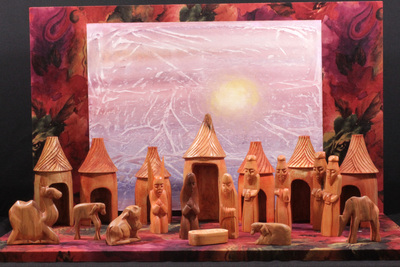 13-piece nativity set handcarved from tweneboa wood, a form of African cedar, by artist John Tse, in Accra, Ghana. Set depicts Mary, Joseph, infant Jesus carved as one piece with manger. Exhibition label written by Fr. Johann G. Roten, S.M. originally for exhibit entitled "African Symphony" held at Roesch Library, University of Dayton.